Every year, the girls and I celebrate National Cheesecake Day. It's hard to resist half-priced slices at The Cheesecake Factory! I have to admit. If I had my choice of desserts, I am not likely to choose cheesecake. I like it, but I don't love it. 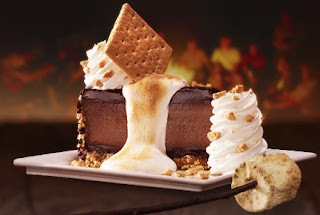 The thing about The Cheesecake Factory is that it offers so many irresistible flavors not just your standard, plain NY style cheesecake. Every year on National Cheesecake Day, The Cheesecake Factory debuts a new flavor. This year's delectable delight was a s'mores flavored cheesecake. It was served topped with a toasted marshmallow!! OMG! We started out with a light lunch. I love ordering from the "Small Plates and Snacks" menu. The portions are the perfect size while leaving room for some cheesecake, of course. I ordered the roasted pear and blue cheese flatbread. Emma had the Greek salad, and Harper ordered the mac and cheese from the kids' menu. We indulged in slices of Kahlua and red velvet cheesecake! We ordered the S'mores cheesecake to go. We had it for dessert that night. It was soooo good. I forgot to take a picture, but this is what it looks like. OMG! We are already looking forward to next year's National Cheesecake Day!